Nieuw Statendam is the second cruise ship in Holland America Line’s Pinnacle class, following her sister ship, Koningsdam. 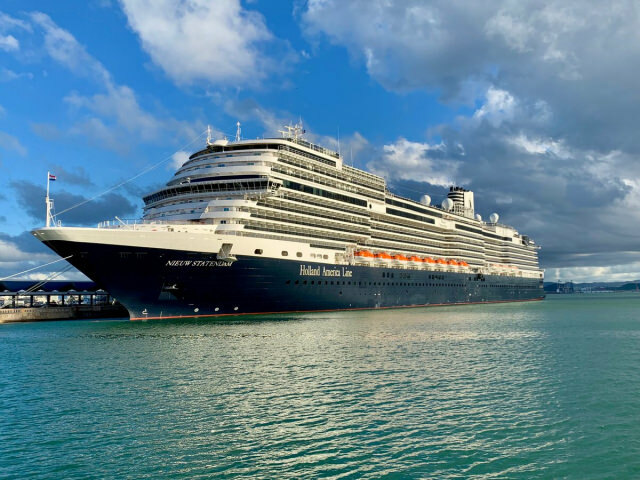 Launched in 2018, the 2,666-passenger ship provides the same comfort as other ships in Holland America Line’s fleet with a modern flair. Though the ship is said not to have a musical theme, music is everpresent throughout the sailing. Whether it is the three music venues that the ship boasts, or simply that decks on the ship are named after composers, music will carry you through your sailing. 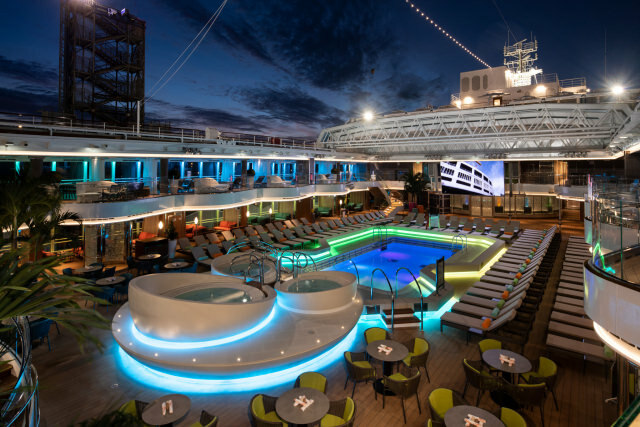 The pools on the ship provide for a perfect place to relax. There are no waterslides or water sports, so the pool areas are relatively quiet. At the tables by the pool, Holland America Line has added a button that you can press when you need an attendant. This allows you to stay in your chair when it is time to relax, but to have a drink in your hand when you need one – quite literally at the press of a button. As far as pools go, I found myself spending the most time at the Sea View Pool. Although the Lido Pool was quiet, the Sea View Pool was nearly silent. The pool provides ample space to swim around, and has two hot tubs on either side. With a bar to the side and lounge chairs all around deck, it is the perfect place to sit and get some sun. The Observation deck houses Explorations Central. With a nice, bright atmosphere, Explorations Central is a great place to sit and have a cocktail while sailing. That’s not all, though. The venue is also serves as an immersion center. Whether you have questions about destinations you’re visiting, need to book or change excursions, or want to attend a lecture – this is the place to go. 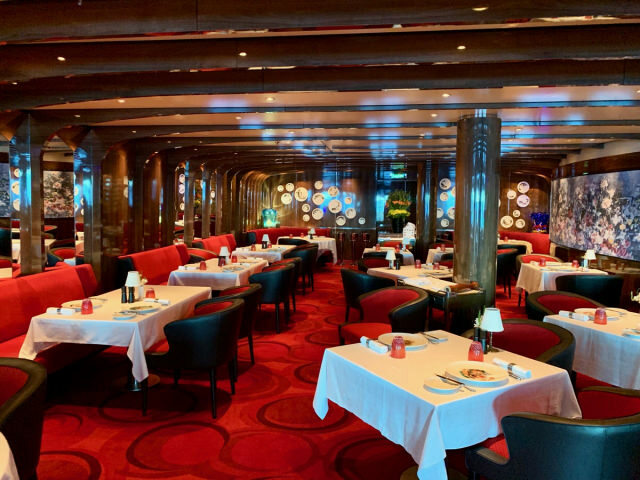 There are many specialty restaurants aboard Nieuw Statendam. The best in our opinion? Rudi’s Sel De Mer. And that’s coming from someone who isn’t particularly fond of seafood. What set Rudi’s apart was the service, and the attention to detail. Whether it be the staff readily offering suggestions to guests based on their desires, or the staff’s intimate knowledge of seafood, including the ability to debone a fish tableside, the service exceeded expectations. Other specialty dining restaurants were great. If I were to go on the ship again, I would avoid the Main Dining Room and stick to Rudi’s, Tamarind, Canaletto, or the Pinnacle Grill. The Main Dining Room just wasn’t up to standard. My food arrived cold twice. Others at the table didn’t seem to have a problem with their food, so I may have just been the odd one out. But my words of advice? Try out any, or all, of the specialty restaurants aboard. You won’t be disappointed. If you can’t spring for speciality dining every night, Club Orange may be an alternate solution. There were a few benefits of the Club Orange program including a tote bag, a dedicated priority concierge line, and a bathrobe for use in the stateroom – but the best benefit of all was access to the Club Orange restaurant where guests are able to dine for breakfast, lunch, and dinner. Club Orange featured the same menu as the main dining room with a couple of additional options, and also included free mimosas at breakfast. At US$50/per guest, per day, Club Orange is a great option for guests who would appreciate these extras. Entertainment is almost always found in the form of music. 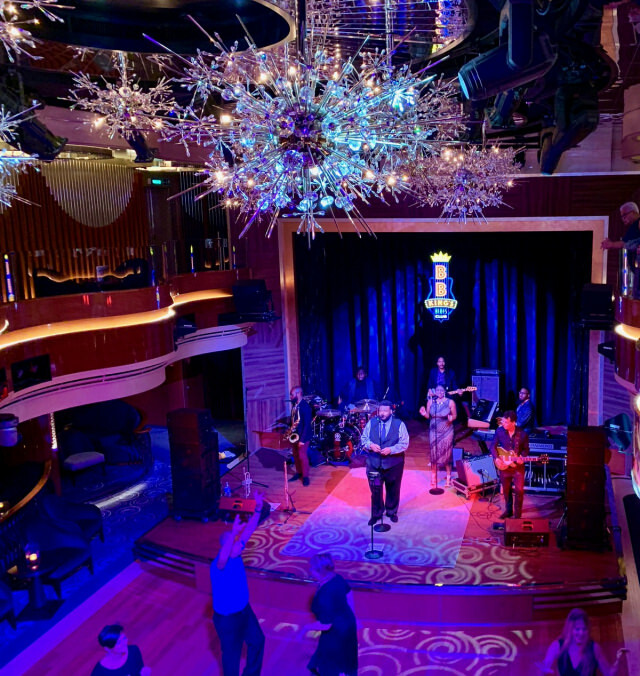 Sure, Nieuw Statendam features America’s Test Kitchen and Exploration Central, but most of what you are going to do will involve music. Shows at World Stage range in style, but feature things like stand-up comedy, dance shows, singers, and more. The best entertainment, however, will be found within the ship’s three music venues – B.B. King’s, Billboard Onboard, and the Rolling Stone Rock Room. B.B. King’s doubles as Lincoln Center Stage, but you won’t get the two confused. While B.B. King’s upbeat jazz brought guests out to the dance floor, Lincoln Center Stage focuses more on orchestral and chamber music. B.B. King’s was the crowd favorite on the sailing. Throughout the trip that venue was the most consistently packed, and most people in the audience ventured out onto the dance floor at least one during the voyage. The band covered well-known music by artists ranging from The Beatles to Aretha Franklin. Verandah Staterooms on Nieuw Statendam don’t leave much to be desired. 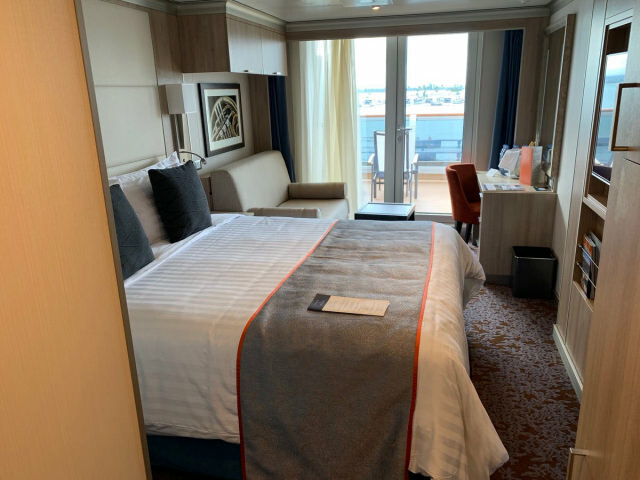 With a comfortable seating area and bed, the stateroom accomplishes what it needs to at a base level; however, there are some extras that set it over the edge. The stateroom design is modern and functional. Storage space is ample, and blends seemlessly into the design of the room. For two adult women who packed a lot of clothes, putting all of our belongings and suitcases away was a breeze. The bathroom on the ship is nice, but nothing to write home about. It was fairly standard, with one exception. The lighting in the bathroom was so bright, which really assisted the process of getting ready. As someone who wears a lot of makeup, it is not always easy to get ready under the dim bathroom lights on some ships. I often find myself bouncing back and forth between the balcony, desk, and bathroom to find the perfect lighting. On Nieuw Statendam, perfect lighting was readily available in one place. My only criticism about the room? The fold out couch bed. Yes, we could have gotten the king bed split into two smaller parts, which would be a viable option for a couple of friends traveling together. However, if there are more than three people in the stateroom, it is going to be tight when the sofa is pulled out. That could be expected; however, we were not able to walk around the couch to get to our balcony, so oftentimes we found ourselves crawling over it instead. 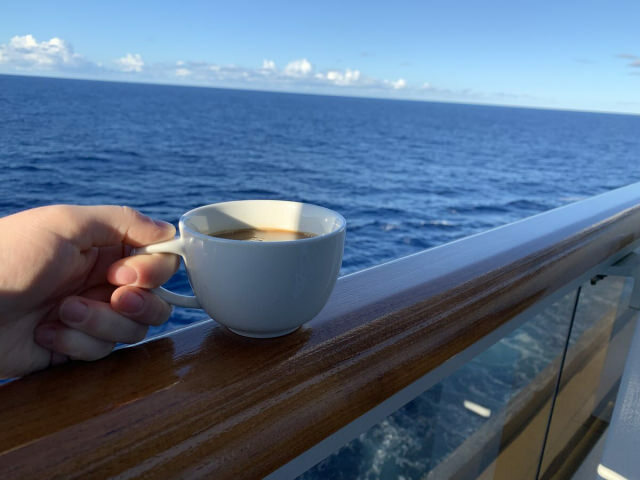 That brings me to the real star of the stateroom – the verandah. Most of the balconies on the ship are double long, meaning they have around twice the space of a traditional verandah. However, our stateroom had a balcony that was double long, and double wide. Giving us about four times the space of a regular verandah. It was the perfect place to sit out while drinking coffee or eating a room-service breakfast. 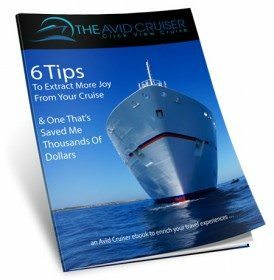 There are things to do aboard that are not centered around music or shows, but more often than not the scheduled activities involve one or both of those elements. While that is typical for some ships, the Music Walk on Nieuw Statendam makes it clear that music is a central focus. Although there are activities for children, the ship is better suited for adults. This is not a ship I would consider taking with children under the age of 21. I would highly recommend this ship, however, for people who like to see a portion of the world in style and comfort while relaxing. The activities and itineraries are well suited for guests in their mid and upper years. If your goal is to party until the sun comes up, this is not the ship for you. But if you’re someone who enjoys a relaxed cruise experience with plenty of pool space, good music and enticing alternative dining venues, then Holland America Line’s Nieuw Statendam may be just for you. As of this writing, Nieuw Statendam is currently sailing throughout the Caribbean. 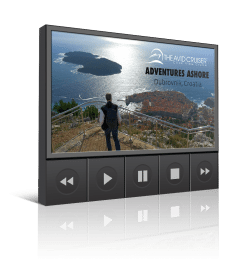 Come summer and fall, the ship will explore Northern Europe and the Mediterranean.